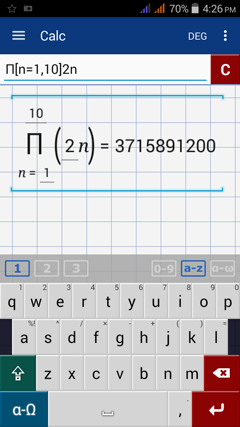 The uppercase Greek letter pi (∏) tells you to find the product of the expression beginning at n = 1, which is written below the product, and evaluate it until n = 10 written on top. In order to find the product, first find the value of the expression at each n and multiply them together to get 2 × 4 × 6 × 8 × 10 × 12 × 14 × 16 × 18 × 20 = 3,715,891,200. 1) Go to the Greek keyboard next to the a-z button. 4) Tap the 0-9 keyboard​ to go back to the default keyboard. ​5) Enter the upper and lower limits in brackets. Separate the values with a comma. 6) Enter the expression. If it is longer than one term, close it in parentheses, e.g. (3x - 1)^2. a) Type pi (∏) ​by going to the Greek keyboard. 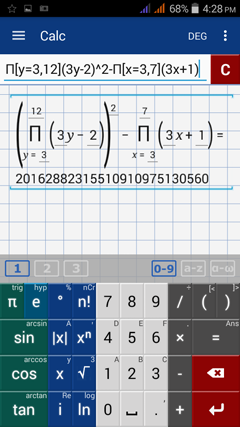 b) Tap the up-arrow key, then select pi (∏). c) Switch back to the 0-9 keyboard to enter the expression. d) Enter the upper and lower limits in brackets. 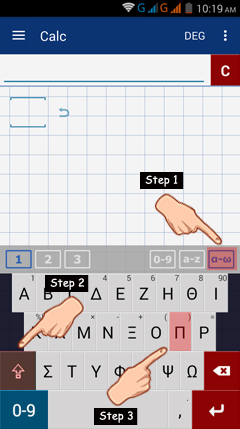 Type brackets by tapping the parentheses keys twice. 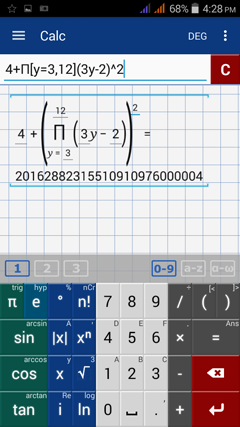 Type the variable either by using the x variable key or by using the a-z​ keyboard. Separate the limits by using a comma. c) Enter the expression of the product in parentheses. 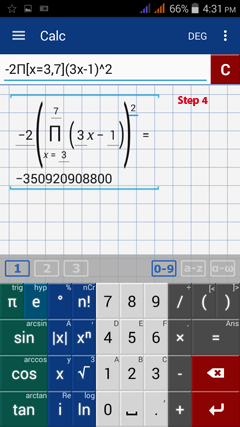 Type the variable n by using the a-z keyboard. Type y by tapping the x variable key twice.